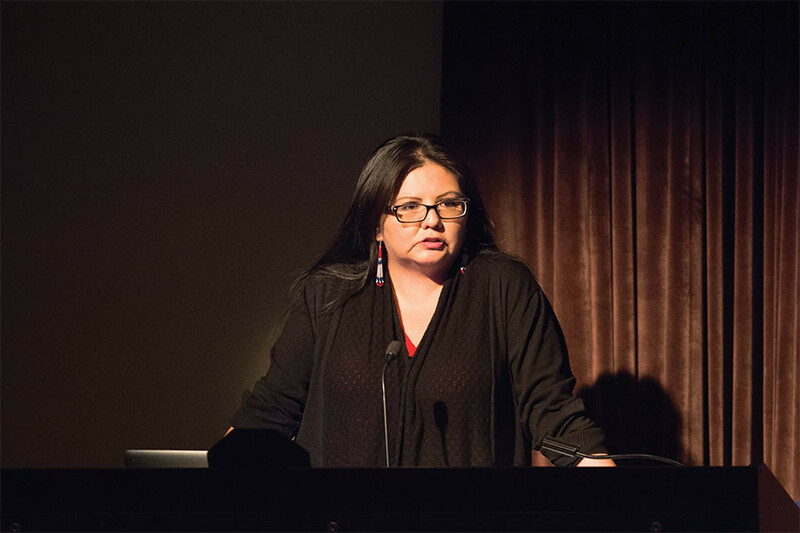 Navajo artist and filmmaker Pamela Peters discusses her recent multimedia project on Native American youth in Los Angeles at Helmerich Auditorium on Thursday. Peters also spoke about the challenges facing "Modern Indians" like cultural appropriation and assimilation. Navajo filmmaker and artist Pamela J. Peters explored the “modern Indian” in discussion Thursday night around her latest multimedia project. More than 15 people attended the gathering at Annie May Swift Hall, where Peters presented the project, Legacy of Exiled NDNz, and spoke on the challenges of Native Americans in modern, urban communities on Thursday night. The event was co-sponsored by the Multicultural Filmmakers Collective and the Native American and Indigenous Student Alliance. Peters’ project examines the lives of seven young Native American adults from various tribes in Los Angeles, who she said either have moved off their reservations or are the offspring of those displaced by the Bureau of Indian Affairs’ Relocation program in the 1950s and 60s. The short film is made up of black and white photos and video, juxtaposed with clips from “The Exiles,” a 1961 film by Kent Mackenzie that tells the story of a group of young Native Americans who left the reservation during relocation for Los Angeles. “I want my images to invoke a contemporary sensibility, the reality of the vibrant, passionate smiling Indians living in urban worlds of yesteryears to today,” she said. Planning for the event began in June, said Communication senior Emelyn Barrientos, a co-programming chair for the Multicultural Filmmakers Collective. Barrientos said she and her partner, Communication senior Natalie Frazier reached out to roughly 10 Native American filmmakers and eventually settled on Peters due to her unique project and background. Frazier said Peters’ existence is revolutionary. Barrientos also commended Peters’ work for the unique format and said the stories of native youth have particular relevance for students at Northwestern. This post has been updated to clarify the event’s sponsors.